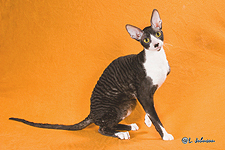 Welcome to the CFA Cornish Rex Breed Council Web Site! Here is where you can obtain information about the Cornish Rex, it's breed history and CFA Breed Standards. As a website for the breed council, members and visitors can read the latest CFA news and breed council news as well. We're still in the process of adding information, so please bear with us. We welcome you to our site and hope you come back and visit us often.